Going to the library is a great way to get your toddler excited about reading and to support the activities he or she is doing at his or her early childhood education center in Pembroke Pines . Library visits can be a fun and positive experience for your toddler and a good way to get him or her engaged in activities that don’t involve the television or your mobile device. Make the most of every library visit with this advice. Before you go to the library, tell your toddler how you expect him or her to behave. Through being a student at an early learning center, your child will have practice following the rules and knowing when to be quiet and when to play, so put these skills to use in the library. Practice talking in a soft voice, and tell your child that he or she can only take one book off the shelf at a time. Remind your toddler to stay with you at all times. When you go into the library with these rules in place, you can focus on enjoying your visit instead of chasing your little one around. The library is full of wonders for your child, so let him or her have fun exploring every nook and cranny. As long as he or she sticks by you, let your child wander the aisles, look at the displays, and enjoy the toys and activities in the kids’ section. Don’t limit visits to just looking at books or just sticking to one section of the building. 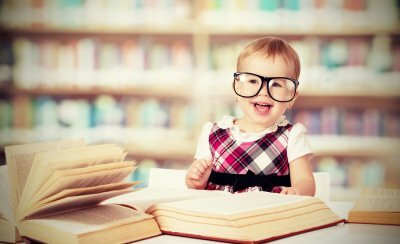 Getting your toddler excited about the library will get him or her excited about reading for life. Your toddler will love the opportunity to pick out books to read together at home. Set a limit and help him or her browse, making selections together. Involve your child in the checkout process, and then use the opportunity to teach him or her about caring for books properly. Find a space at home that is just for library books, so they don’t get mixed with your own collection. © 2018 All rights reserved for Tanglewood Academy. Preschool and Early Childhood Education in Pembroke Pines, FL.